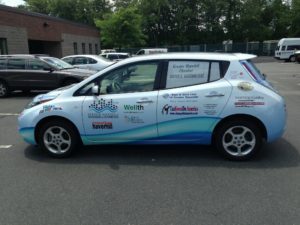 Check out this eye-grabbing vehicle wrap we created for the Greater Haverhill Chamber of Commerce! We used curved lines to flow with the shape of the car using the chamber’s colors, and the logos for many of the terrific businesses that are part of the chamber. SpeedPro can wrap any size vehicle to show off your brand or organization!